Goan Food is a unique blend of Portuguese and Indian cuisines. 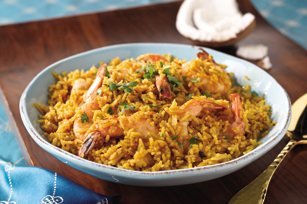 Kraft oil and Vinegar dressing simplifies the traditional paella by adding its own special flavour and reducing prep steps. Place rice in medium bowl. Add enough cold water to cover rice. Let stand 10 min. Meanwhile, combine next 10 ingredients. Heat oil in large saucepan on medium-high heat. Add next 3 ingredients; cook and stir 5 min. or until onions are crisp-tender. Drain rice. Add to onion mixture in skillet with the shrimp mixture; stir. Cover; bring to boil. Simmer on medium-low heat 20 to 25 min. or until rice is tender and liquid is absorbed. Remove from heat; let stand 5 min. For best results, do not stir or remove the lid from the pan of rice as it cooks.